Poultry meat and eggs are the largest source of animal protein in the human diet worldwide. These are the benefits of decades of poultry research investments that were aimed at developing fast-growing strains, a better understanding of nutrient metabolism and utilization, and the effects of those nutrients on gene expression. The South African poultry industry has advanced alongside global trends in most developed countries. The industry is dominated by a few fully integrated large commercial producers, and a high volume of small-scale producers, either as contract growers or individual producers supplying solely the informal market. Currently, the poultry industry is battling to remain competitive, owing to tons of imported dark chicken meat being dumped in this market by other countries at prices below the cost of production locally. This has had negative consequences on producers, big and small, and on the employment rate. Disease outbreaks, welfare regulations, food safety, house environment and a number of issues relating to nutrition and feeding are among current and future challenges to the poultry industry, particularly the small-scale segment. With urbanization escalating, land availability and accessibility for intensive poultry rearing, and crop production for feed will be a challenge. Simultaneously, although poultry has the lowest carbon and water footprint, global warming is likely to affect feed quality and quantity, increasing feed and energy costs, thereby influencing food security. In future, maize and soybean meal on a worldwide basis will remain the major ingredients in poultry diets, although research on feedstuffs for partial replacement of these two will still be relevant, more so for home mixers. Focus on poultry science education and training, research and extension partnerships between poultry scientists and veterinarians also needs serious attention. Lack of collaboration between the private and public sectors, and lack of innovative ways to articulate concerns from producers and consumers to policy makers remain barriers to technological adoption. This review adopts poultry in sole reference to chickens. 'Poultry' collectively refers to domesticated birds, especially those valued for their meat and eggs, such as chickens, turkeys, ducks, geese and guinea fowl. Of all avian breeds, chicken breeds make up the vast majority of 63%, followed by ducks at 11%, geese at 9% and turkeys 5%, but indigenous or heritage breeds make up most of the world's poultry genetic diversity (Pym, 2013). Over the past 50 years, the poultry sector has expanded, consolidated and globalized, driven primarily by strong demand, making it possibly the fastest growing and most flexible of all livestock sectors (McLeod et al., 2009). Efficiency in the poultry sector is driven by quality in feed formulation and faster growth performance, influenced by genetics and health conditions (Gerber et al., 2015). Poultry can achieve the highest growth rates and lowest costs per unit of output, mainly because of efficient feed conversion, an advantage they have over other livestock species that cannot do this to the same extent, ruminants in particular (Gerber et al., 2015). Even so, current and projected levels of livestock production would not be possible without the expanding production and yield increase of crop agriculture (Steinfeld et al., 2006). South Africa is the largest commercial poultry-producing country on the African continent, followed by Egypt, Morocco, Nigeria and then Algeria, in that order. In South Africa, poultry products make the largest locally produced, affordable and consumed animal protein, thus meeting the government's zero-hunger goals (South African Poultry Association (SAPA) 2016). The industry is the largest segment of the country's agricultural sector, contributing more than 16% of its share of gross domestic product. In 2015, approximately 20.9% of the total agricultural gross value and over 42.8% of animal product gross value was derived from poultry production (SAPA, 2015). The industry provides employment, directly and indirectly, for about 108 000 people throughout its value chain and related industries. Furthermore, it provides a strong platform for rural development through the large number of small-scale producers who mostly supply the informal market. 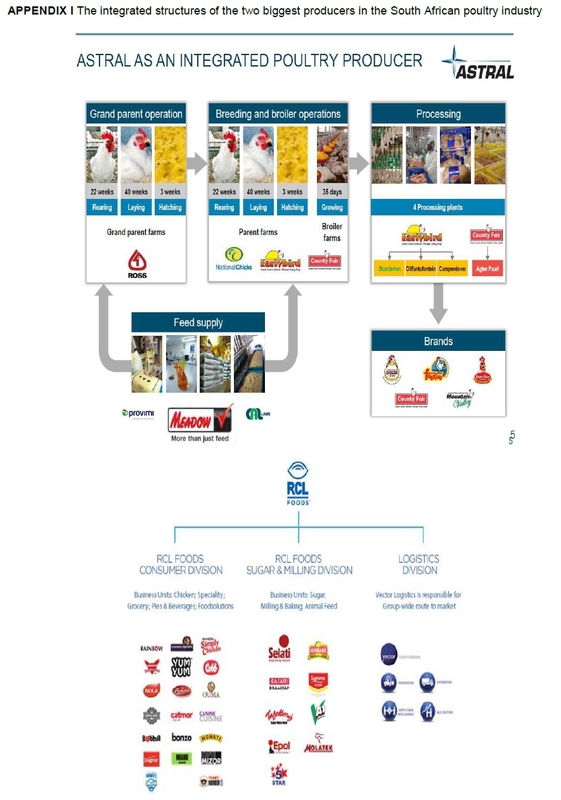 However, most chickens are produced commercially by a few consolidated and fully integrated companies, with RCL Foods and Astral being the country's largest chicken producers. Comparatively, on a global context, the South African poultry industry struggles to remain competitive. Profit margins are hampered by feed costs, often making up 75% of total production costs. For the most part, occasional changes in maize and soybean meal prices are impossible to incorporate in the prices of chicken meat and eggs; thus, profit margins remain volatile. Meanwhile, supply has yet to match demand, as the country has become the net importer of dark meat, which is sold to South Africa at prices below the cost of production from Brazil, the United States and the European Union (EU). These countries produce loads of cereal grains and oilseeds for poultry farming and are subsidised, whereas South Africa has an insufficient supply of locally grown inputs for feed manufacturing. In effect, high input costs of production have been aggravated by recent drought effects on crop production and the consistent poor performance of the rand against international markets. For this reason, several medium-enterprise commercial producers have closed down recently, while small-scale producers, owing to low economies of scale and lack of integrated value chains scuffle to infiltrate the commercial producer space. Even more detrimental to small-scale producers, they lack price advantage, a situation aggravated by delayed land allocation to upscale their farming operations. To make matters worse, several South African companies have moved to countries north of the continent, namely Zambia, Ethiopia, Angola and Tanzania, in an attempt to cushion their enterprises and to diversify away from the South African market. The situation raises important issues for the country and its policy makers, from unemployment to food security, and has implications for economic and social stability (Brinkhuis et al., 2017). In as much as dark meat imports lessen food insecurity, without income, chicken meat may soon become unaffordable to many households. The objective of this review article is to discuss the current trends and the potential challenges facing current and future growth of the South African poultry industry, and whether policymakers and industry stakeholders have in place strategies that will allow sustainable economic growth socially and environmentally. Historically, farming was simply a hunter-gather phenomenon, which meant human beings depended on the environment for their everyday food security. Animal production, therefore, is first and foremost about providing a growing global human population with essential dietary protein from animals. A 70% increase in food production is projected by 2050 in order to meet nutritional needs of the world's postulated population increases of 9.1 billion (FAO, 2009). The largest of this population growth is expected to be in Africa. Several options have been explored to address the food security challenge through adoption of new technologies and investment in research, including increasing production potential, that are coordinated in a multifaceted and linked global strategy to ensure sustainable and equitable food security (Godfray et al., 2010). Poultry production provides affordable quality protein for consumers, while it generates up- and downstream investment opportunities for producers, thus contributing to economic and social sustainability (Rodic et al., 2011). In any farming system, the scale of production is critical, because it defines the inputs required and their cost, as well as the revenue that is to be realised from the sale of products. Therefore, clear distinctions between substance and small-scale and small-scale and commercial is critical. As correctly stated by Herrero et al. (2010), the major culprit in agricultural development is the fundamental failure to value the scope of agrarian frameworks that are expected to feed our planet in the coming decades and the policies adopted to achieve this goal. Many critical survival issues are related to uneven development, poverty, and population growth - all of which place unprecedented pressures on the planet's natural resources, particularly in the developing countries (Brundtland, 1987). The concept of sustainability is multi-dimensional, encompassing economic, environmental, social and institutional governance aspects (Vaarst et al., 2015). According to the Brundtland Report (1987), sustainable development promises a more equitable and wealthy world in which the natural environment and cultural achievements of present populations are preserved for future generations. Achieving sustainability requires an understanding of human beings as ecological entities. Three of the United Nations' Millennium Development Goals (MDGs) aim to eradicate poverty through sustainable economic development. For instance, Goal 1 is to eradicate extreme poverty and hunger, Goal 7 is to ensure environmental sustainability, while Goal 8 encompasses global partnership for development. Smith (2013) alluded to sustainable intensification, whereby agricultural systems remain largely unchanged, and demand follows current projections, but in which agricultural production becomes more efficient. Simply said, sustainable intensification refers to the process of maximizing delivery of safe and nutritious food per unit of input resource, without increasing pressure on land (Smith, 2013). Despite the important role of poultry production in alleviating food insecurity, uplifting rural livelihoods and supporting gender equity, most governments in developing countries attribute low importance to this production system (Pym, 2013). The advantages with poultry production lie in its diverse nature, responding to the main purpose of the flock, feed and nutrient requirements, orientation and the type of housing (Mottet & Tempio, 2017). Throughout the world, poultry can easily be integrated into many farming systems, particularly in rural communities at subsistence and small-scale level for sustainable livelihoods. Extensive poultry production is practised by virtually every household in rural communities, even some urban ones, using hardy indigenous breeds or nondescript breeds that can be kept in low-cost housing and are provided with complete feeds and water, and are also vaccinated against diseases. Several poultry equipment manufacturers operate in the country, providing services to commercial and small-scale producers. In South Africa, poultry housing equipment suppliers, such as Dicla, Chicken Shack and Big Dutchman, manufacture and supply environmental to semi-environmentally controlled houses, as well as drinking, feeding, lighting, and ventilation equipment to small-scale farmers. Globally, chickens are the most commercialized variety of the avian species and are valuable animals. Chickens convert many feed types, such as residuals from agricultural activities, households and food processing industries, into protein food more efficiently than other animal species. For small-scale producers, who aspire to produce commercially, poultry is important because it is produced in large numbers and in intensive operations, making it one of the fastest growing agricultural sub-sectors that require less land (Mottet & Tempio, 2017). Since the early 1990s, economic and political conditions in South Africa have supported the formation of co-operatives and farmer associations among small-scale producers giving them an opportunity to exploit economies of scale. Broiler production, in particular, for many years has provided a pathway into enterprising for small-scale farmers and women, and in ensuring food security for underprivileged households, thus contributing to millennium goals regarding gender issues (Vaarst et al., 2015). However, broiler production is an expensive business that requires costly investments in specialized infrastructure. Although the poultry sector has strong potential to adapt and thrive, it is often not possible for small-scale producers to take the necessary adjustments (McLeod et al., 2009). Owing to factors of competition and lack of biosecurity controls, a majority of small-scale producers fail to enter the retail market for sustainable enterprising. Factors at play include the cost of feeding, electricity, water quality and supply, as well as proximity of small-scale producers to chicks and feed suppliers, processors and markets. The major successes in poultry production are seen in integrated business structures, which necessitate the adoption of cooperative farming in a value-chain system, in which farmers buy together and sell together, whether they are in feed manufacturing, or breeding and rearing. Engaging in the commercial poultry production system requires that all standards of operation are adhered to starting with breeding to handling and transportation of chicks, processing (feed ingredients and chicken products) and feed manufacturing. For instance, the key activities for Astral and RCL, both leading South African integrated poultry producers, consist of manufacturing of animal feed premixes (vitamins and minerals) and complete feeds, broiler genetic production and sale of day-old chicks, and processing plants, which produce whole birds, portioned birds, and processed meats (Appendix I). Among the advantages of full integration, the industry has access to optimal genetic material that is internationally owned and enters the country only as fertile eggs for parent stock. This genetic material is wholly accessible to the commercial sector, with small-scale producers struggling to access day-old chicks and point-of-lay pullets. While access to markets remains critical for small-scale farmers, growing markets continue to benefit large-scale operations. The major challenge for small-scale producers is unsustainable production systems owing to dependency on government for inputs ranging from housing, feeds, vaccines and poultry species (day-old chicks and point-of lay pullets) to marketing. This embodies the conviction that the private sector is a great untapped resource for investment and innovation to achieve the MDGs (UNDP, 2008). Together, public- and private-sector institutions determine the information that key food system actors have about the performance of alternative approaches to farming and food provision and affect the relative economic viability of farm production and food processing systems (Nesheim et al., 2015). What is needed is a transparent vision and differentiation between commercial and small-scale poultry production. Transformations to increase the productive capacity and stability of small-scale production can be achieved, provided that the most appropriate technologies and practices are identified through building an accessible knowledge-based support system (Branca et al., 2013). Many small-scale producers in South African practise contract growing, rearing day-old chicks for large commercial producers, who provide them with all the inputs, then purchase the live birds back on an agreed kilogram per rand basis. This has become a popular alternative way to enter the broiler production market - it provides small-scale producers with an incentive to make the investment and offers protection against input cost increases. Any producer can enter this arrangement, provided he or she has a facility that is conducive to commercial production. Confronted with population growth and climate change, it is incumbent on all developing countries to focus policies towards production intensification that limits ecological effects and reinforces access to markets for small-scale farmers (Herrero et al., 2010). The truth is, while Africa has experienced high growth rates in the last few years, the strong growth cannot reconcile poverty with inequality reduction, especially if the markets in which the poor and vulnerable interact are not made inclusive (AIMEC, 2016). In future, as urbanization escalates, land availability and accessibility for intensive poultry rearing and crop production for feed will be a challenge. Most agricultural land is consistently transformed to residential areas. The effects of climate change are a further threat, but the world has the capacity to produce more food, provided that a multifaceted and linked global strategy is adopted to ensure that efficient and equitably food use (Godfray et al., 2010). The Network of African Science Academies (NASAC, 2015) suggests that African governments and business leaders have begun to view science, technology and innovation as critical to the continent's socio-economic development. However, unless these declarations and expressions translate into actions and outcomes through dedicated implementation programmes, self-reliance in food production remains an unattainable goal. At present, access to extension support for small-scale farmers is almost non-existent. To be sustainable, the poultry industry needs to respond to the growing demand for meat and eggs, but still consider its role beyond just providing food (Mottet & Tempio, 2017). Global food production, driven by scientific and technical advances in crop production and many innovations in animal sciences, fisheries and more recently aquaculture, for many years has been able to meet the demand to feed an ever-increasing human population (Lang & Ingram, 2013). Human diets constitute a variety of plant and animal foods, depending on availability and accessibility within a context that promotes and supports healthy behaviours (Johns & Sthapit, 2004). Often the analyses of food security tends to assume that insecurity stems from insufficiency of production or supply; thus pursuing the public policy notion of a situation where everyone is fed or could be fed adequately, appropriately, affordably and regularly (Lang & Ingram, 2013). Realistically, though, people eat what is available, affordable and familiar to them. For low-income households, food prices are important decision-making tools, implying that buying red meat or selecting a steak menu evokes guilt emotions associated with having to spend too much of their limited income (Sosa et al., 2015). As shown in Figure 1, foods such as rice, wheat, maize (corn), millet, sorghum, roots and tubers (potatoes, cassava, yams and taro), and animal products such as meat, milk, eggs, cheese and fish are important staples for over 1 000 million people in the developing world, accounting for 40% of the food eaten by half the population of sub-Saharan Africa (OECD/FAO, 2016). However, meat consumption is related to living standards, dietary choices, livestock production and consumer prices, as well as macroeconomic aspects related to the gross domestic product (GDP) of that particular country. Poultry meat is perceived as good value, dependable, versatile and healthy, but mostly affordable. Globally, consumer demand trends reveal an increase in white meat consumption and a decline in red meat. 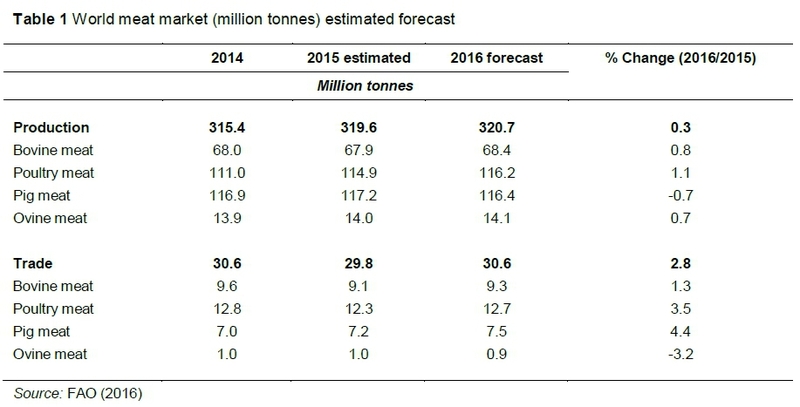 In 2016, world meat production forecast (Table 1) was at 320.7 million tonnes carcass weight equivalent. While the anticipated growth for all meats was a meagre 0.3 per cent, poultry meat output was expected to rise by more than 1 per cent to a record high of 116.2 million tonnes in the same period. This means total poultry meat production would have risen by some 5.2 million tonnes (4.7 per cent) since 2014, with hardly any changes in other meats (The PoultrySite, 2016). In 2013, SAPA reported that the only protein source more affordable than broiler meat was eggs, with poultry meat consumption by South Africans quantified at close to 35.7 kg for that year (The PoultrySite, 2014). Approximately 2.9 million tons of poultry, beef and pork meat was consumed in 2016, with poultry meat representing more than 60 per cent of total meat consumption (The PoultrySite, 2016). Unfortunately, in recent years, even poultry meat consumption seems to have declined due to a rise in unemployment and a drop in consumer spending power. Global statistics show that backyard systems contribute 8% in egg production and 2% of meat, with 92% of poultry meat production being specialized broiler systems, while layers contribute only to 6% of the total, with a small contribution to meat from spent layers from egg production and broiler breeding systems (Mottet & Tempio, 2017). Then again, global figures do not reflect important regional differences and the significant contribution that backyard systems make to eggs and poultry meat production in Eastern Europe, South Asia and sub-Saharan Africa and, to a lesser extent, East Asia and Latin America and the Caribbean (Mottet & Tempio, 2017). In contrast though, egg consumption is low, perceived as being associated with raised blood cholesterol levels. This is coupled with cultural perceptions in black communities that eggs speed up attainment of puberty, therefore early maturity in girls (SAPA, personal communication). Functional modelling enables researchers to make sense of data that reframes a long list of genetic material, grouping it based on function, be they individual molecular functions or interactions between these molecules or broader biological processes, including metabolic and signalling pathways (McCarthy & Lyons, 2013). The need for high production efficiency, combined with the complexity and cost of running effective breeding programmes, has resulted in commercially selected lines of broilers and layers replacing several slow-growing breeds previously kept for production (Pym, 2013). Historically, remarkable genetic progress has been observed for growth and feed conversion through the efforts of the primary breeding companies, albeit significant between-strain variation still exists owing to differences in selection criteria (Emmerson, 1997). To date, male broilers reach 3 kg at 40 days of age, and white-egg layers are capable of producing in excess of 330 eggs in 52 weeks of lay (Leeson, 2012). This is the investment that poultry breeding companies have made through the development of the highly successful intellectual property of superior breeds by exploiting heterosis, and the deleterious segregation of hybrid stocks in the next generation (Hoffmann, 2005). Subsequent to all this innovation, breeding companies remain the sole suppliers of useful genetic material through access restrictions to pure parent line stock and selling the F1 generation birds (Hoffmann, 2005). Coupled with advances in feed formulation techniques, consolidation and full vertical integration between breeding and feed manufacturing is a business tool that has sustained the poultry sector throughout the years. Further incorporation of logistics, rearing, processing and marketing reflects a value-chain system that cannot be easily applied in other livestock industries. With the use of models, the interaction of nutritional specifications for specific poultry strains, production objectives in a given environment over the years has been elucidated, and great benefits will be evident and appreciated only in the future (Kidd, 2009). South Africa, commercially, has benefitted greatly from international breeding companies operating in the country, making new technologies available first hand. Now poultry geneticists are not only able to work on a much more diverse range of breeds and varieties, but are rapidly identifying novel gene elements, working with more complex datasets that integrate gene expression, metabolomics, SNP analysis and phenotypic data sets (McCarthy & Lyons, 2013). However, negative traits associated with growth and feed conversion, such as ascites, sudden death syndrome, reduced immune competence, tibial dyschondroplasia, reduced reproductive performance and other metabolic disturbances represent physiological and economic limits to future progress (Emmerson, 1997). However, continued improvements in poultry efficiency are necessary to meet expected increases in consumer demand for poultry products, more so with future prospects of limited land availability for crop production for animal feed. Besides, the follow-up and the interpretation of genetic trend performances make efficiency monitoring possible to ensure that improvement strategies and the selection pressure is directed towards the traits of economic importance (Hudson & Kennedy,1985). Lately, there has been a call for slow growing broilers from the African and Indian consumer populations in South Africa. The importance of indigenous poultry breeds for subsistence farmers in many developing countries, combined with consumers' preference for their eggs and meat, suggests that innovation to enhance these genetic resources is necessary and still relevant (Pym, 2013). Therefore, efforts have to be made to improve productivity of indigenous chicken in a sustainable way, and to shift the extensive subsistence mode of production system to a semi-intensive one, focusing on market orientation (Moges et al., 2010). Recently, the Africa Chicken Genetic Gains (ACGG) programme has identified tropically adapted and more productive chicken ecotypes from all over the world to test under farmer conditions, to identify farmer preferred strains and to initiate a long-term genetic gains programme using these preferred strains (Tadelle, 2016). Similarly, SASSO in France has selected for the Label Rouge broilers that are slow growing and suitable for free-range outdoor rearing with a full guide on breeding, nutritional and health management (SASSO). Perhaps local geneticists should also look at developing efficient strains for small-scale farmers. This will require support for technology development, adoption and use. The Animal Feed Manufacturers Association of South Africa (AFMA) is the official representative body of the South African feed industry in the livestock feed sector and larger agricultural environment. A significant component of the feed raw materials used in poultry feed manufacturing is grown in South Africa. However, imports cannot be avoided to meet the feed demands of an expanding poultry sector, putting further pressure on prices. Moreover, as livestock production grows and intensifies, it depends less and less on locally available feed resources, and increasingly on feed concentrates that are traded domestically and internationally. In 2004, a total of 690 million tonnes of cereals were fed to livestock (34% of the global cereal harvest) and another 18 million tonnes of oilseeds (mainly soya). In addition, 295 million tonnes of protein-rich processing by-products were used as feed, mainly bran, oilcakes and fish meal (Steinfeld et al., 2006). Drought effects in major cereal producing countries have reduced the ability of suppliers to respond, and higher costs of feed translate to lower margins for livestock producers and elevated food prices for consumers. Feed costs for poultry production are high in South Africa, with small-scale producers paying an extra R50 to R100 for a bag of feed more than commercial producers. They require small quantities of feed for 200 to 500 birds, therefore can buy only through middlemen, while access to feed raw materials is even more complicated. As vital links in the food chain, feed manufacturers and producers are having to give due consideration to changing social and economic climates (Chadd, 2008). Income growth in developing countries is driving strong growth in per capita and total meat consumption, leading to increases in feed consumption of cereals, particularly maize (Msangi et al., 2014). The South African broiler industry is a major consumer of maize, as it is the primary energy source used in broiler diets. 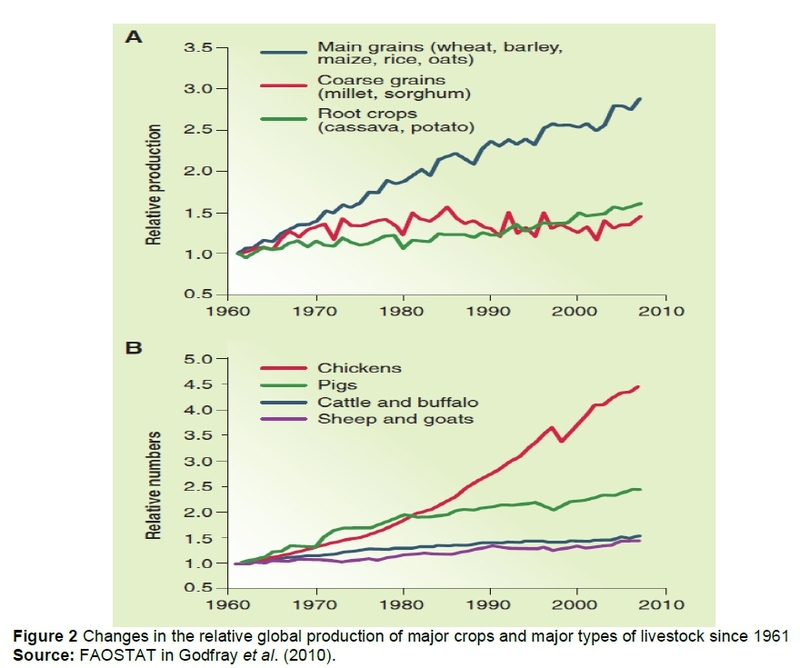 Changes in the relative global production of crops and animals depict a direct linear relationship between poultry production and maize consumption (Figure 2). Energy sources constitute the largest component of poultry diets, followed by plant protein sources and animal protein sources, and energy and protein both represent the most expensive nutrients in poultry feeds. In many parts of the world, maize and soybeans remain the preferred energy and protein yielding ingredients, respectively (Ravindran, 2013). Although a few hundred tonnes of a new by-product may be fitted into a local production system, there simply is no undiscovered ingredient that is going to have an impact on the price of maize and soybean meal (Leeson, 2012). Although poultry are efficient feed converters, adequate physiologically balanced nutrition is vital to the health, fertility and optimal performance of birds. Yellow maize, other than its energy value, is important for its high carotene levels, which are responsible for the yellow coloration of egg yolks, feet, shanks and skin. Generally, maize is highly digestible and palatable for poultry, and is free of anti-nutritional factors. Similarly, soybean meal is the most widely used oilseed by-product because of its ability to provide indispensable amino acids, which complement most cereal-based diets, are highly digestible and are low in undesirable substances. Soybean meal contains 40% to 48% crude protein, depending on the number of hulls removed and the oil extraction procedure, and relative to other oilseed meals its metabolizable energy content is also substantially higher. Over the last century, great strides have been made in poultry nutrition science to define, evaluate, ascertain and meet the nutrient requirements for optimal weight gain, feed efficiency and egg production for various poultry strains (Leeson & Summers, 2001). The science of nutrition, applied to both meat and egg production sectors, emphasises the effect of various nutrients, individually, on selected organs and tissues and more on mechanisms investigated at cellular level, rather than total feed on the whole animal (Chadd, 2008). Even though diet formulation, feeding programmes and production goals with effect on ever-evolving diet specifications are continually changing (Leeson & Summers, 2005), little has changed in the nutrient requirements of meat birds and layers over the past 50 years, and there are no foreseeable major changes in future (Leeson, 2012). Nevertheless, given extraordinary changes in the growth and productive potential of modern poultry strains, and coupled with changes in body composition and egg output, nutrient needs have changed beyond what the bird can compensate for with increasing intake per unit of bodyweight (Applegate & Angel, 2014). Therefore, in formulating feeds, nutritionists ought to know the nutrient composition of raw materials and how much the animal can extract from each to balance its daily nutrient requirements, particularly energy and protein. Nutritional composition plays a significant role in the growth and performance chicks during the first week of their life, because post hatch, the digestive system and secretion of digestive enzymes are poorly developed, leading to poor feed utilization efficiency (Noy & Sklan, 1995; Sklan, 2001). For a holistic approach, the significant proportion of costs of production attributable to feed is now considered alongside bird welfare, food safety and environmental protection concerns with implications for volumes of legislation, particularly in the EU (Chadd, 2008). 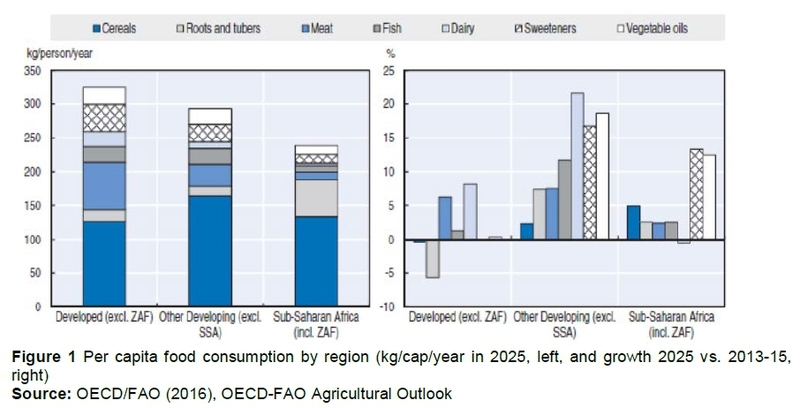 In future, feed will remain the major input cost for poultry meat and egg production, while maize and soybean meal will remain the energy and protein yielding ingredients, respectively, in all poultry diets, thereby perpetuating dominance of maize-producing regions of the world (Leeson, 2012). Several cereal grain by-products, including milling by-products and oilseeds byproducts, will continue to be included in poultry diets to partially replace maize and soybean meal, especially in least-cost formulations. Currently, South Africa imports supplemental maize and oilseeds, and this is likely to continue in the future. Non-conventional feed resources and by-products are consistently researched and deduced to be as valuable as maize and soybean meal in poultry feed manufacturing, but this reveals a lack of understanding of world animal and crop production (Leeson, 2012). Albeit, with many feed additive companies operating and selling their products in the country, the adoption and use of non-conversional feed resources may not be ruled out. Nutrient availability in various ingredients is affected by the presence of anti-nutritional factors such as fibre, but several strategies to formulate suitable diets to feed at various stages of growth continually be explored. Furthermore, to mitigate high feed costs and improve feed digestibility in birds, the use of exogenous enzymes and other additives is well established and has been received favourable by feed manufacturers and producers (Mateos et al. 2012). Within the past 50 years, there has been rapid change in the way value chains are organized in the animal food production sector. Intensive animal production has been accompanied by a decline in animal welfare standards. Vertical integration provides economies of scale, ensures supply reliability and facilitates quality management and homogeneity of products. Most importantly, it allows producers to mitigate the wide host of pathogen threats to which the animal food value chains are subject (Steinfeld et al., 2006). To date, through advances in poultry production science, the availability and consumption of poultry eggs and meat has been maximized globally, albeit to the detriment of welfare considerations. Although poultry provide lean meat with limited pollution from manure compared with other livestock, intensive poultry farming scores poorly on welfare grounds (McLeod et al., 2009). The nitrogen that is not retained during metabolism is voided in manure, of which although recycled to fertilizer, parts may be lost to the environment as gaseous emissions and leaching, which contributes to air and water pollution, as well as climate change (Mottet & Tempio, 2017). The European Commission (2002) developed a white paper on current research and future directions in farm animal welfare. The paper defines food safety to broadly encompass epidemiology of food-related diseases; the impact of food on health; traceability; analysis, detection and control; the impact of animal feed on health; environmental health risks; and safer and environmentally friendly production methods and healthier foodstuffs. Topics directly related to animal welfare include comparative assessment of production methods, improved food animal production and animal welfare, and the application of plant/animal science and technology, including genomics, to improve food quality. In many instances, the quality assurance on the housing environment, handling, feed and water availability, location and biosecurity standards are welfare considerations. From an animal production point of view, observation of the five freedoms for animal welfare is emphasised. These encompass freedom from hunger and thirst, from discomfort, from pain, injury and disease, to express normal behaviour, and from fear and distress. The welfare of an animal is its state as regards its attempts to cope with its environment (Broom, 1990). Pertaining to broilers, within the last two decades the main welfare issues have been closely linked with the fast early growth rate, that is, high susceptibility to metabolic disorders and low physical activity (Bessei, 2006). Because commercial breeders select for robust increased productivity, challenges with keeping structural and supply organs synchronized with the growth of demand tissues such as muscle in meat birds are continuous (Dibner et al., 2007). The large decline in days to market and disproportional increases in breast yield have contributed to greater incidences of skeletal anomalies, resulting in abnormal long bone development in broilers owing to significantly slower relative tibia development (length and width) in broilers (Lilburn, 1994). The most frequently affected systems are the structural bone, joints, tendons and the connective tissue of the legs and feet (Dibner et al., 2007). In the future, however, with nutritional strategies being used to reduce these skeletal challenges, fractional losses in measures of carcass yield may still be economically advantageous compared with the cost of increased leg problems under field conditions (Lilburn, 1994). In the floor system, birds are often exposed to the danger of disease, to aggression from dominant birds and to the risk of cannibalism (Appleby & Hughes, 1991). In the egg industry, where feeding, health and protection from cannibalism are concerned, the welfare needs of laying hens are well catered for in cages (Baxter, 1994). However, caging chickens has been tied to increased food safety risk in addition to impaired acquisition of normal gut flora, compromised gastrointestinal function and physiological stressors (Shields & Greger, 2013). Conventional cages are less likely than other systems to provide freedom of movement, freedom from fear, comfort and shelter, suitable flooring and freedom to display most normal patterns of behaviour (Appleby & Hughes, 1991). To be precise, caged hens are deprived of litter, are prevented from dust bathing and foraging, are without access to a nest site, nesting motivation is frustrated and, without a perch, roosting is prevented. Restrictions on movement in a cage cause frustration and prevent normal bone maintenance, particularly in the legs and wings (Baxter, 1994). Handling and management of spent layers during transportation over long distances from Gauteng, North West and the Western Cape to the Eastern Cape has been regarded as warranting research (Lovell, 2016). The incidence of bone breakage and other traumas by SAPA in end-of-lay birds at the time of slaughter, owing to poor handling during loading and transportation, has important welfare and commercial implications (Broom, 1990). Some consumers, concerned for human health, the environment and welfare, have reduced animal protein in their diets. On 14 January 2001, the EU Food Marketing Institute (FMI) board of directors adopted a policy and programme that stated that animals must be raised, transported and processed in a clean, safe environment free from cruelty, abuse and neglect. The policy added that retailers will work with the food production industry to promote best practices, will consult regularly with experts in animal science and animal welfare, will urge governments to strictly enforce animal protection laws and will communicate best practices to maintain consumer confidence. Large retailers in developing countries are increasingly tending towards vertical integration, although coordinated chains may interact with informal markets that supply inputs of live animals or products (Steinfeld et al., 3006). In South Africa, retailers are quite mindful of where they source their food products to meet consumers' food safety needs. Following growing international concerns that every state should be the custodian on all matters related to food safety and provision of sanitary guarantees required by consumers and trade partners, the South African government revised old regulation on abattoir practices and adopted The Meat Safety Act 2000 (Act 40 of 2000). However, a majority of small-scale producers are found wanting in this regard, and as a result they struggle to sell their produce directly to retailers. Today's consumers are generally more health conscious and react strongly to perceived safety issues associated with consumption of animal products. Globally, poultry meat and eggs still represent a major part of animal protein consumed by human beings, despite the food safety challenges the industry has been facing (Butcher & Yegani, 2009). However, increases in the consumption of poultry products represent a threat to human health, especially as a vector of infectious diseases and because of their role in antimicrobial resistance. Problems that affect poultry sales are associated mainly with diseases, consumer reactions and control measures (McLeod et al., 2009). Diseases are generally responsible for mortality, reduced growth rate and egg production in poultry flocks, resulting in reduced economic returns to producers (Butcher & Yegani, 2009). Precautionary measures that the industry adopted to curb the occurrence of diseases include farm biosecurity, consistent good hygiene standards and vaccination programmes, but the risk of an outbreak is inevitable. Biosecurity is variously described as an ideal state of affairs in which measures are in place to prevent incursion and spread of disease, or the approach or principles used to achieve this state of affairs (FAO, 2007). The Department of Agriculture and Fisheries (DAFF, 2013) and SAPA have a clear policy on biosecurity standards and vaccination programmes on poultry farms. The policy states that poultry producers in the provinces within the country should consult with the local state veterinarian for prevalent diseases that should be vaccinated against. On a global perspective, the measures included under biosecurity can be broad or more narrowly defined and may be applied on any scale from national policy to the management of an individual production unit (FAO, 2007). Table 2 classifies poultry production on the basis of biosecurity level (FAO/ OIE 2007). Nevertheless, despite progress in prevention and control of infectious diseases, commercial poultry farms continue to be affected by the emergence of new or variant disease agents (Butcher & Yegani, 2009). Another problem is adherence to biosecurity standards at processing plants, especially in live chicken markets. Although some provinces have devised strategies to address the challenge of poultry abattoirs and biosecurity practices during slaughter, overall there is little infrastructure to facilitate the slaughter and marketing of poultry products in small-scale production in South Africa. Live poultry markets are an important part of the poultry supply chain in many parts of the world, but they have been implicated in the zoonotic transmission of avian influenza viruses from live poultry to traders and customers (FAO, 2015). The recent outbreak of avian influenza was the largest in the history of the South African poultry industry, with greater losses of poultry and eggs, trade restrictions and market losses. The epidemiology of avian influenza viruses is not well understood, because there are many vectors, including wild birds and other wildlife (Herrero et al., 2010). This transmission can occur via direct or indirect contact, although in many cases the exact route is not known (FAO, 2015). In as much as water birds are perceived to be the natural host of avian influenza (NICD, 2017) large concentrations of both backyard and intensive system flocks, coupled with poor disease control or underfunded veterinary services, pose significant risks for the spread of the disease (Herrero et al., 2010). Therefore, in training small-scale farmers, a serious linkage between poultry development and the poultry health plan should be created to improve public health hazards. Throughout the country, recent outbreaks of avian influenza continue to be a source of considerable concern. During the recent outbreak, which is now contained, the collaborative efforts between the DAFF and SAPA resulted in a well-managed situation. Even though affected farms were placed under quarantine, and affected birds were culled and eggs destroyed, new outbreaks keep occurring in some parts of the country (The PoultrySite, 2017). The outbreak had a major impact on breeding farms, as well as layer farms, resulting in shortages in point-of-lay pullets and one-day-old-chick supply, which saw an increase in the price of chicken meat and eggs. The issue of antibiotic growth promoters remains the single largest factor to affect the poultry sector worldwide. Currently and in the future, the mandatory or voluntary removal or reduction in the use of in-feed antibiotic growth promoters remains a consumer concern, prompted by reports from several organisations including the World Health Organization (WHO, 2001). Judiciary use of AGPs is well regulated in many countries, while in South Africa the Animal Feeds Manufacturers Association (AFMA) and DAFF monitor adherence to the Fertilizers, Farm Feeds, Agricultural Remedies and Stock Remedies Act 36 of 1947. A slight concern is with small-scale producers, who are sometimes unable to purchase all the feeds in a recommended phase feeding programme owing to socio-economic challenges and high feed costs. Moreover, small-scale producers operate in the informal market, where traceability or quality assurance evaluations are not conducted on the meat or even on processing and production sites. It may never be known whether some of the communicable and non-communicable diseases encountered in public hospitals are as a result of quality from the poultry products they consume. This risks non-compliance with the Act 36 of 1947, which may increase cases of drug resistance among poor consumers. Thus, public education of both producers and consumers is a critical consideration that needs all stakeholders to work together. There has been an intentional effort to increase the effectiveness of the industry through SAPA, working together with DAFF. In January 2017, a task team was established by government to deal with the crisis in the poultry sector that saw the industry bleeding jobs at an alarming rate. The task team comprised representatives of the Department of Trade and Industry (DTI), DAFF and Economic Development (DED), as well as the Industrial Development Corporation (IDC). The sector industry association, Poultry SA, represents business and labour is represented by the Food and Allied Workers' Union (FAWU). The team was tasked to propose a range of short- and longer-term interventions relating to trade measures, health and quality issues, competitiveness, industry growth and transformation, industrial financing, incentives and demand side interventions (The Poultrysite, 2017). The innovation system is positioned to assist industry along its path to growth and, with its targeted policies and activities, to contribute to accelerated development and success. Currently, the industry delivers economic diversification, attracts and retains highly educated people, and promotes intellectual property development by various companies in the private sector space. However, for some reason, there seems to be poor skills transfer between commercial producers and emerging or small-scale farmers. This is evidenced by the fact that when commercial producers close down some of the plants, it becomes impossible for small-scale farmers or even municipalities to take over production in those facilities. It boggles one's mind that even labourers at these farms are not able to collectively put together a business plan for funding and run these operations successfully. Consequently, the country has good infrastructure that is poorly utilised, if at all. Unfortunately this country imports chicken to meet demand, but continually fails to empower those who are passionate about poultry production. The major challenge is that agriculture is poorly subsidised, so new entrants into the sector hardly survive. Even graduates with all the theory and practical skills are not supported enough financially to start and sustain their own production systems. Furthermore, there is still a great need for industry-academic partnerships to engage in innovative research to generate knowledge economy in poultry production in the country for extensive and sustainable use locally and internationally. Research and innovations shape the trajectory of technological change in the farm and food industry sectors (Nesheim et al., 2015). Animal science departments at universities are principle generators and disseminators of scientific information relating to the production of farm animals and their food products. Their missions are teaching, research and extension, designed to advance and enhance scientific knowledge in agriculture and to make this knowledge available to the public (Swanson, 1999). Animal science is one of the scientific disciplines that places merit on applied and basic science, hence, research should be focused to address animal production issues that are unique to a region. Farmers, consumers and the economy benefit when the rate of technological development and commercialization can compete with other global jurisdictions. Farmers and the food industry are obvious key stakeholders in future research as they are directly involved in rearing and processing farm animals (European Commission, 2002). Therefore, it cannot be taken for granted that academics should be specialized in various disciplines in animal sciences, and master the concepts to tackle issues that are encountered by farmers in day-to-day farming practice. The knowledge should be transferred by well-trained academics to graduate students, who are the next generation of professionals that will likely possess positions in industry, academia and government (Swanson, 1999). Particularly in South Africa and other developing countries where animal productivity has to be optimised, we cannot afford to have jacks of all trades in animal science education. At the moment, academic researchers in the South Africa are consumers and users of existing knowledge with little or no contribution to the advancement of poultry production, either at small-scale or commercial level. Academically, we continue to generate publishable work that has no practical application or interpretation, while the developed countries have advanced their thinking in line with new genetic improvements that are taking place in the poultry sector. In the US, technological innovation in food and agriculture is a collaborative effort by the extensive network of public agricultural research institutions (e.g., land-grant universities, the Agricultural Research Service) and the significant research and development (R&D) programmes implemented by private-sector agribusiness and food industry firms (Nesheim et al., 2015). The mission of this network is to integrate research, education and extension, and land-grant universities have been especially critical of agricultural R&D by creating an effective avenue of communicating the most pressing concerns from farmers to researchers, and communicating solutions from researchers to farmers through the extension network (Nesheim et al., 2015). However, the database on livestock in developing countries, particularly in sub-Saharan Africa, has historically been fragmented and inaccessible, somewhat limiting potential livestock quantification (Msangi et al., 2014). A similar scenario is found in South Africa, where the database for small-scale and emerging poultry farmers does not provide conclusive evidence on the scale of production, product produced and markets. Poultry scientists with focused poultry science training are becoming a scarce resource at academic institutions in South Africa, and this seems to be a global challenge. The number of poultry science departments in the US has declined dramatically, and scientist years and research funding for poultry, relative to other commodities, have also declined (Pardue, 1997, Yegani, 2009). This has a direct negative bearing on poultry science research being conducted and made available to user stakeholders. Agricultural research is defined as work intended to benefit agriculture and directed towards those problems that seem capable of solution, but science research is something else (Morris, 1996). This has happened partly because exciting prospects have opened up in certain fields, but mainly because of the use of inappropriate referees to evaluate research proposals (Morris, 1996). The role of scientists is to put forward and then to test theories, hence the value of modelling in research and education (Gous, 2014). For many years, animal science research required that universities should have an infrastructure that would mimic the environment under which the animal will be managed in a production system. Now with recent cuts on research funding across the world, the use of this infrastructure has been reduced. Since the 1920s, the term 'infrastructure' has been used to refer collectively to the roads, power grids, telephone systems, bridges, rail lines and similar public works that are required for an industrial economy to function, while a recent term 'cyberinfrastructure' refers to infrastructure based on distributed computer, information and communication technology (Atkins et al., 2008). According to Kelbert (2014), there are two arguments about the need for infrastructure to do our science. The first argument is that, investment in large infrastructure is selective and favours the kinds of science that use the new capabilities, with the eventuality that the infrastructure could ultimately drive the science, and not the other way around. The other argument is that large infrastructure creates new scientific possibilities that could not have been imagined before such infrastructure existed. In an endeavour to be active role players in knowledge generation within the innovation space, both arguments are correct. The same applies to animal/poultry science research. In an increasing fraction of cases, it is faster, cheaper and more accurate to simulate a model than construct and observe a physical object, thus allowing high-quality remote collaboration feasible (Atkins et al., 2003). There is a great deal research that should be done in poultry science in the next 20 years, but it calls for recognition that some problems cannot be solved by a 'fundamental' approach, but need experiments with whole animals, coupled with modelling (Morris, 1996). Besides the major concern of ethics, several challenges are often encountered with animal experimentation; namely, requirement of skilled manpower, time consuming protocols and high cost (Doke & Dhawale, 2015). As Atkins et al. (2008) echoed, if infrastructure is required for an industrial economy, then we could say that cyberinfrastructure is required for a knowledge economy. Perhaps infrastructure investments should be the minimum required to accomplish a scientific goal, then the models should be used to draw from the knowledge economy to make future decisions as new data or research outcomes are generated (Kelbert, 2014). Numerical models allow controlled hypothesis testing, and output can be used for data exploration and to inform further data collection (Kelbert, 2014; Doke & Dhawale, 2015). Useful ideas for research are generated in this way, and experiments may be designed to address specific issues, resulting in more accurate and more useful models that can be used in education and extension as a means of explaining many of the complex issues that arise in poultry science (Gous, 2014). Additionally, systematic reviews would ensure that animal experiments do not set out to answer questions that have already been answered, reduce bias and increase precision, while providing reassurance about whether the results can be generalized (Guimaräes, 2009). As with all research, the value of a systematic review depends on what was done, the findings and the interpretation of results. Statistical methods may or may not be used in systematic reviews, but if statistical techniques are used, the review is referred to as meta-analysis (Moher et al., 2009). Theories generated in models may be simple or highly complex, but they are aimed at improving our understanding of a system or the interaction between systems, having taken into account existing knowledge, and in the process identified gaps in our knowledge of a system (Gous, 2014). A partial answer lies in adopting computational approaches to advance a more evidence-driven model for decision making, both at scientific and at policy level (Stanzione, 2011). This requires a scientific literacy that integrates an understanding of principal scientific theories, the nature of scientific research, and the relationship between science and society, as well as a teaching approach that enhances the intellectual and ethical development of students, allowing them to serve themselves and society in responsible ways (Schillo, 1997). The major dilemma in the system is that, over time, retirement of professors who craft research ideas, source the funding for the infrastructure and equipment, and successfully implement the research as outlined in the proposal is inevitable. This becomes even more of a trajectory if many of these professors did not incorporate a succession plan in their training of postgraduates for continuity. Consequently, universities are overburdened with state-of-the-art infrastructure and equipment, but with no new minds to put it good use, thereby sustaining the objectives for which it was procured. Moreover, university policies change and government funding priorities towards research also change. Albeit the heaviest blow for academics is when the private sector, both breeding and feed manufacturing companies, conduct their own research in-house, in instances where it is outsourced to the university, the company owns all the intellectual property and it cannot be disseminated in scientific publications. To date, technological protection strategies and contractual practices, rather than formal intellectual property rights strategies, have dominated in the commercial poultry sector (Hoffmann, 2005). This is the scenario in South Africa, but it does not have to be so. Unless industry invests in crafting partnerships with universities, existing infrastructure will go unused and unmaintained. The Department of Trade and Industry (DTI) in South Africa largely supports this engagement through the THRIP (Technology & Human Resources for Industry Programme) where the private company develops the proposal for innovation and partners with a university of choice for implementation. The intellectual property (IP) can be shared between the partners, it all depends on the terms and conditions of engagement, but the DTI does provide the platform to companies to innovate through partnerships with universities. Therefore, it remains with the private sector and academia to take advantage of such opportunities. Private research focus is mostly on technologies that are likely to result in market applications and returns to investment (Hoffmann, 2005). Nutrient requirements for current poultry genotypes, including the required rearing environment are known; and may change only slightly for future strains, as long as we do not revert to what used to be before the current advances. Focusing on the future, maternal immunity transfer to the progeny in both layers and broiler breeders remains an important for further exploration. It is evident that the relationship between welfare of poultry and their environment is complex, and that because of the need to maximize food production, choices between rearing systems are difficult, especially as economics have to be taken into account. Many of the new technologically improved poultry housing materials are costly, therefore inaccessible to small-scale producers. Unfortunately, this is where animal welfare considerations are often neglected, perhaps owing to lack of knowledge, for which extension workers should create awareness, and develop strategies for monitoring and evaluation on production practices. Furthermore, given the threat of increased microbial resistance in human beings, the search for alternative additives will remain relevant, with gut health as the centre focus. Sustainability and profitability in poultry production will always be dependent on effective biosecurity practices. I wish to thank the South African Society for Animal Science for having me as an invited speaker on this important topic on poultry production in South Africa. I am also grateful to the National Research Foundation for all the grants I have been awarded over the years to advance poultry research and human capital development through supervision of postgraduates. I am the only author of this review and there are no conflicts of interest.